Richardson & Owden's Warehouse designed by W. H. Lynn. Donegall Square North (facing City Hall), Belfast, Northern Ireland. 1869. W. H. Lynn's stately brownstone warehouse for Richardson Sons and Owden (1869) seems every inch an Italian Palazzo office block in the Ruskinian -Venetian mode (in fact, it is currently the front part of Marks and Spenser's). Its immaculate Mansard roof was restored after the original fell victim to the German blitz on May 1941 that levelled warehouses along the docks and destroyed the City Hall's Banqueting Hall. C. E. B. Brett terms the edifice Lynn's "most successful achievement, and certainly his most successful venture into the realms of commerce" (44). The firm for whom No. 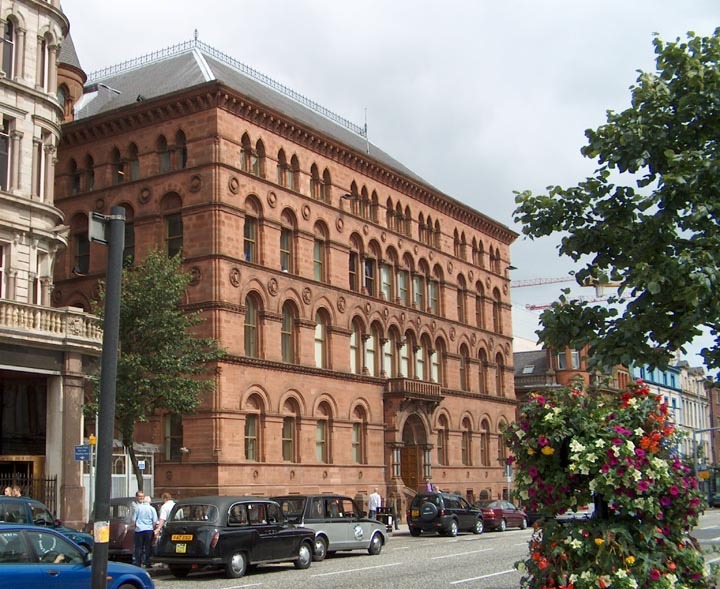 1 Donegall Square North was built, Richardson Sons and Owden, were linen merchants. Just prior to World War II, the building was acquired by the Belfast Water Board, but the entire interior was gutted in the blitz and had to be restored at considerable cost. Still one of the city's finest façades, it was mentioned in Oscar Wilde's locally delivered lecture on "The House Beautiful" (1 January 1884): "In Belfast they had, at any rate one beautiful building" (cited in Brett, 44-45). Text and photograph by Philip V. Allingham 2006. You may use this image without prior permission for any scholarly or educational purpose as long as you (1) credit the photographer and (2) link your document to this URL in a web document or cite the Victorian Web in a print one.